I had no intention to create a bunny. I was working on another project and had cut two teaspoons to use the upper parts. The leftover handles were laying on my worktable side by side and they just looked like a pair of bunny ears. I tried to continue my work on the other creature but those ears just screamed at me. All I could think was B-U-N-N-Y. Well, yes, I get distracted easily. With Easter being just around the corner, I had at least a good excuse to bring that bunny to life right away. His name is GrEgg Hopper. I found a pocket watch case in my stash that had the perfect size to become the head. Once he had a head, GrEgg started to have a mind of his own. He wanted a nose piercing. Can you believe it? Personally, I’m not a big fan of poking holes in other body parts than ears but I wasn’t able to talk him out of it. Here you go, bunny. A paint brush was certainly mandatory. GrEgg went to work instantly and painted some eggs to live up to his name. I’m so glad he helps me decorating for Easter. Oh Julia what a fun post. I have over the years collected Rabbits, amongest LOTS of other things. But they are still my favorite. This little creation is the cutest! 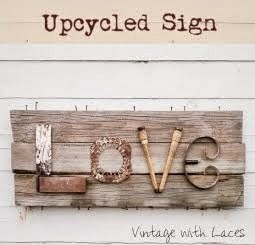 Love repurposing and mixed media and you made this Eggstra special. Thanks for sharing and keep up the good work. Have a fun week. GrEgg is so very delightful! As is your story of his coming into existence...just in time to help you with Easter decorating. What a great bunny. I'm with you on the piercings, but we'll just have to give this one to GrEgg. You gave him the most marvelous name as well! Wonderful character assemblage! He is TOO CUTE!!! Love those whiskers. How do you attach your metal pieces? Glue? You have great vision to assemble all those fun metal trickets into GrEgg (LOVE the name!!). Thank you so much, Audra! Only the nose with the whiskers and the brush are glued on. I attached the ears by soldering them onto the watch case, for everthing else I used screws and nuts. Julia your altered bunny art is absolutely adorable. Very clever very cute. What a creative mind you have, to be able to make something adorable from bits and pieces and the vision to put it all together!! I love the Bunny Julia! So beautiful and unique! I'm speechless over here. 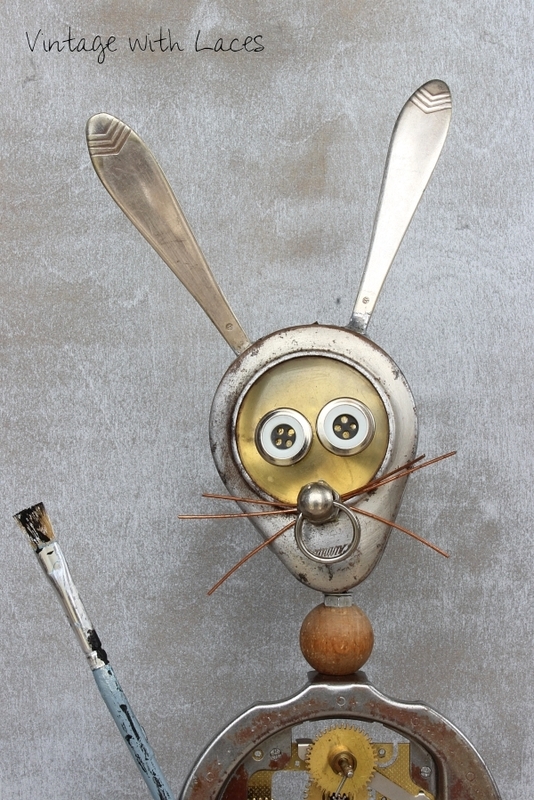 What an amazing vision you had to see rabbit ears in the handles, then turn them into this adorable creation. You come up with the best names too. I'm so happy you're sharing GrEgg tomorrow at Talk of the Town. This is so fun and whimsical...I love seeing your creativity! ein sehr ausgefallener aber wunderschöner Osterhase, sehr originell. So adorable!!! You are so creative!!! I wished my mind worked like yours LOL!!! Ach Julia, warum hab ich, wenn ich deine umwerfenden Figurenschöpfungen sehe, immer gleich das Bedürfnis, eine halbe Weltreise zu unternehmen und dich zu umarmen. Diese Wesen sprechen zu mir. Ich war schon in GrEggs Vorgänger (sowohl die Jungs als auch in die Lady) verknallt, und nun ist noch ein weiteres Liebesobjekt hinzugekommen. Mr. Hopper besitzt sensationellen Charme – und das sage ich, obwohl auch ich nicht auf Nasenpiercings stehe. (Mein erster Gedanke war allerdings: Schnuller ;o)) Und ist es nicht wundervoll, dass Materialien manchmal ihren eigenen Willen haben und danach schreien, etwas Bestimmtes zu werden? Ich erinnere mich noch gut an die Puppenköpfe, die ich vor vielen, vielen Jahren machte – gemeinsam mit zwei Freundinnen gestaltete ich Figuren zu Michael Endes Gauklermärchen https://de.wikipedia.org/wiki/Das_Gauklerm%C3%A4rchen . Zweimal versuchte ich mich an der Prinzessin Eli und beide Male machte die Papiermacheepampe das, was SIE wollte: Mein erster Kopf wurde Angramain, die Spinne, mein zweiter Kopf wollte eindeutig der eines alten Mannes sein (ich weiß jetzt nicht mehr, ob das die Figur des Bauchredners war oder die des Eheministers…) Ich beschloss dann, dass ich für liebliche Figuren nicht geschaffen bin und so wurde meine nächste Figur Wilma, die Kunstschützin und Messerwerferin. Die Prinzessin hat dann meine Freundin Brigitte gemacht. Und in den frühen 1990ern wollte ich aus Ton eine Turnerin formen – daraus wurde dann meine „Erdmutter“ (eine Schwangere). Es war eine Art prophetische Arbeit, ein Vierteljahr bevor ich tatsächlich schwanger wurde… Du siehst also, dein wundervoller Hase wollte unbedingt geboren werden, da hattest du gar keine andere Wahl! Hab noch einen schönen Tag und eine angenehme restliche Woche! what a cute little bunny ! I love it. You are fantastic liebeste Julia , gorgeous with the watch part in his body and he painted the eggs so pretty, too. Liebste grüsse, und ich umarme dir viel, sending kisses across the world, to hope they reach you. I love how your mind works Julia! GrEgg is fantastic. I absolutely adore him!!! 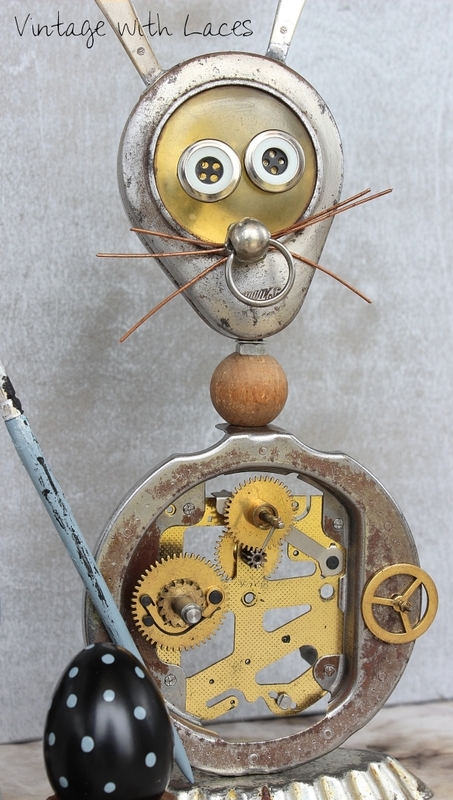 You have an amazing talent for making your junk creations really come to life with all the details you choose. The pierced nose made me chuckle. Love the copper whiskers, and everything else about him actually. I'm so looking forward to seeing him at Vintage Charm tomorrow. Oh my goodness I never know what I will see from your left field imagination next time I come to visit sweetie. 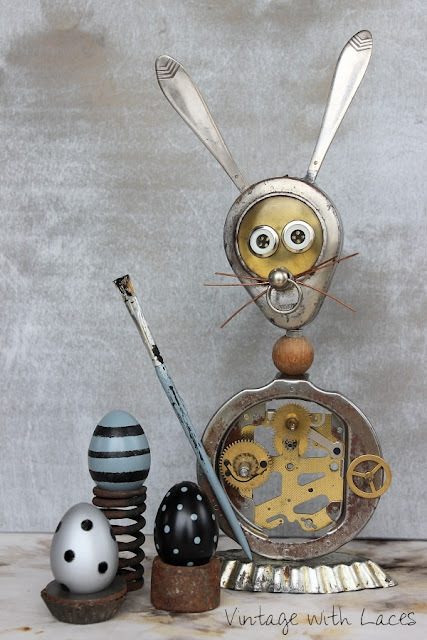 I have never seen the likes of GrEgg - simply a steam punk rabbit with all the necessary workings to keep him going. I love my darling bird card and wishes sweet friend and I so want to write a long letter to you but I'm running out of time everyday with organizing the move with our huge haul of things which I have been selling and sorting and then packing but know you are in my thoughts so much. How very talented you are and just love the amazing GrEgg and will be great for your Easter display. The little eggs are cute too. Well, I'm glad you followed through. GrEgg Hopper is adorable! Happy Easter! Oh my but he is more than adorable. So creative too! Makes me smile to look at him. Julia, this is the cutest thing ever! Love it! ich kann mal wieder nicht widerstehen, ich möchte das Bild von GrEgg samt deinem Link gern am Ende meines nächsten Blogbeitrags posten - ich hoffe, das passt für dich? Er ist einfach soo entzückend und ich finde, es sollten ihn noch VIEL MEHR Menschen kennenlernen! Ich wünsche dir und deinen 2-bis 4-beinigen Lieben schöne Ostertage! was für ein toller Ostrhase! Ich bewundere immer wieder deine Kreativität! Einfach genial! Oh, Julia! GrEgg Hopper looks like an escapee from the set of a mad science fiction film. He is adorable. I hope you take him on a lot of adventures. Wow, how impressive! This is so unique and creative. Love the name too! It does look like something out of Mad Maxx, but also cute. Julia, I would love to invite you to share this great post at our link party, Dishing It & Digging It today at 4:00 EST. Happy Sunday. Still in love with your junk bunny Julia! 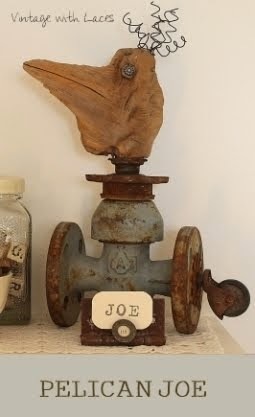 Thanks so much for sharing him at Vintage Charm! Your GrEgg just knocks my socks off, dear Julia:) Have a Happy Easter. Hi Julia. Just popping in to let you know that I featured your fabulous GrEgg Hopper at Vintage Charm today. Thanks again for sharing him with us! Hahaha! Oh my gersh, I adore him! A face every mother could love. Ich wünsche dir ein wunderschönes Osterwochenende! He is the cutest bunny I have seen in a long time. what a wonder you are with the old parts. Have a Happy Easter. What a clever clever bunny indeed! I just love seeing how you can make art with metals and gadgets and then make something in beautiful fabric! Love your talent!!! He is just too darn adorable! Thanks for sharing him at Talk of the Town! I'm sure the very handsome Mr. GrEgg Hopper was the life of the party at your Easter gathering, Julia! However do you dream up these delightful characters?!!! Grüß mir jedenfalls deine anderen großartigen Schöpfungen, kraul mir die Miezen und fühl dich von mir herzlichst gedrückt!